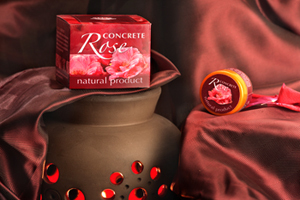 The concrete is obtained by extraction of fresh rose blossoms of the Bulgarian oil-yielding rose. The concrete is orange-red waxy substance, bearing the typical fresh rose fragrance. The rose absolute content in it is not less than 60%. It comprises also different plant waxes. Rose concrete has a diverse and rich composition – more than 160 components. The concrete, produced by processing the Bulgarian oil-yielding rose blossoms is considered to have the highest quality. It is used mainly for production of absolute, as well as in many cosmetics and perfumery products. It has anti-inflammatory, softening and regenerating effect; added in small amounts to creams and balms it will make the skin soft and fresh-looking. It has a fresh, floral, warm and balmy aroma - applied to pulse points it has a long-lasting perfume aroma.